And that is a scary, scary thing. A very old textbook shows how noses were re-shaped in the late fifteen hundreds. We think of plastic surgery as a relatively modern innovation. But actually, it's been around for a long time. 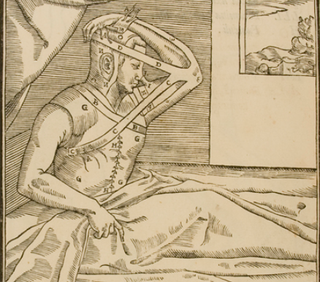 Over four hundred years ago, at least a few surgeons were already performing rhinoplasty. There were some notable differences, though. Today, all a patient has to do is pony up the dough or go on Bridalplasty. Back then, they really had to want it. A book published in 1597 by a professor of surgery at the Universty de Bologna has a section describing how doctors re-shaped a patient's nose. It was a weeks-long process that had to be both painful and inconvenient. First, the skin on the patient's arm was sewn to the patient's nose, with the arm still attached. The patient stayed like that, with their arm glued to their face, for about three weeks. After three weeks, a portion of the skin on the arm would have grown to attach itself to the patient's nose. The arm was released, but the procedure still wasn't over yet. After another two weeks, the new nose skin was stretched and shaped, like putty, to give the patient a nose. The surgery wasn't a popular choice with women, since an oddly-shaped nose wasn't much of a problem in a time when having a good portion of one's teeth meant beauty. It was most often performed on gravely wounded war veterans.